I cant find a place to leave a comment on the battery life with GAIA GPS article you just updated for 2018. I noticed there was no mention of Power Saver Mode (or whatever its called) on iOS or how since the iPhone X is OLED and the blacks take no power to display if you put your phone in Classic Invert and Grayscale color filter under Display accommodations and a white(AKA Black background) how those would affect the battery life? Thanks. Thanks for the quick reply. Now that I think about it the grayscale thing and inverting colors might be a little too crazy… LOL at that point it would seem like I would be regressing to my base model Garmen eTrex… but the power saver mode is pretty cool and if it helps squeak out a little bit more battery if all you’re doing is tracking and taking pictures then it would be worth it probably. Also, I’m going to be going on a four day camping trip if I understand correctly let me know if I have this power saving set up correctly according to article. I do prefer to record the track constantly and I do have a couple little battery packs to compensate for the constant tracking. 3. Close all background running apps. 6. Pause the gps tracking when we stop for the night. That combined should get me roughly 2% battery drain per hour correct? I do like to take a lot of pictures so I know that will drain as well. Any suggestions? I am currently not putting the phone into battery save mode. I leave bluetooth on for my inReach with no ill effects. You will likely need to bring screen brightness up a bit in the middle the day or you may not be able to read it. Is there a source of topographical maps of South Africa which one can download to the GAIA app? Good Q Don. And yes there are a number of worldwide maps. OpenHikingMapHD is worldwide and likely the best. It’s similar to Google Terrain but it has more info. E.g. I was looking at the very new Nat. Park in Patagonia and it has a number of the Parks’s standard trails on it. 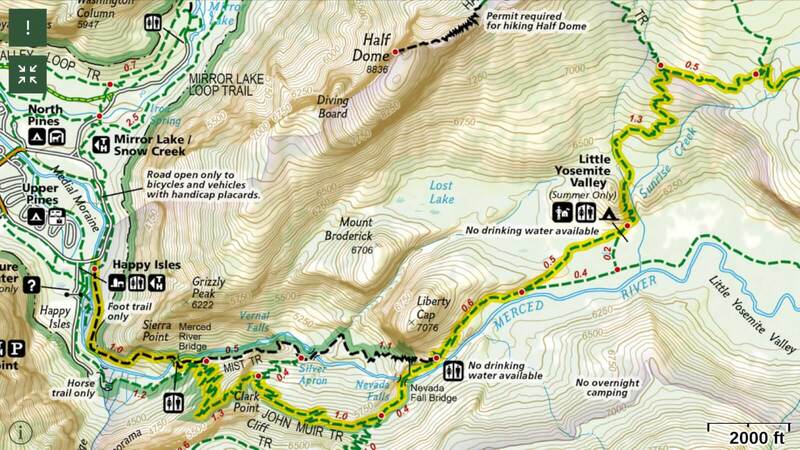 There’s also the similar MapBox Outdoors HD, and OpenCycleMap HD both of these also have a number of hiking trails. I will note that none of these worldwide map sources are as detailed as say USGS Topo maps for the US (altho they sometimes have more up-to-date feature info) or something like the British Ordinance Survey maps for England. For that you’ll need to go to the local country with the few country exceptions noted in this post and the iPhone GPS Post. My iPad was repossessed or will be within a week. I have/had the Gaia program download on it and have a number of tracks on the device. Can I transfer the program to my new device or do I need to purchase a new app for the new device? It is not so much the money issue, it is the tracks and the waypoints that I am going to lose. Joe, synch your GAIA with the cloud (it’s a GAIA option). I bought the Suunto Amit Peak 3 and have been playing around with it for the past week along with Gaia GPS, which I have been using for a few years now. There’s some pretty major discrepancies between the two that I’ve noticed thus far. Primarily, distance and altitude on the exact same hikes at the exact same locations is significantly different. Take a look at these photos which I have put next to each other that were snapped at the exact same time and place. Still around 6K’ altitude, and a whole mile MORE than Gaia GPS. I am using the “Fused Alti” function on the watch and have calibrated it the couple of times now. The difference in altitude has consistently been around 100’ to 150‘ between the two devices. Today however, Suunto said I was at 6000 feet when I was really closer to 600’. Also, the distance on the exact same 3 or 4 mile hike was a whole mile difference. Huge variation considering it was only three, or at most 4 mile hike. Hunter there are going to be some measurement differences between the Ambit and GAIA. I have noticed them as well. And have even done some tests to determine what’s going on. In general tho the two have agreed within 10% on mileage. Mostly based on where they are plotting locations (accuracy) and the frequency of point recording. I happened to have used both today on a moderate hike. Personally, I am not going to worry about those differences. 1) ELEVATION – GAIA is likely doing elevation lookups based on position and 3d earth terrain/altitude models. But the Ambit is using a barometric altimeter with all that entails. So not at all surprised that there are differences. 2) DISTANCE – GAIA waypoints (on my iPhone 6+ and X) are more accurate and placed more frequently. The Ambit in best accuracy (low battery life) mode is very close to GAIA in waypoint locations and accuracy. But I if I set it to “good” accuracy (better battery life) then it is less accurate in placing waypoints and therefore, less accurate on mileage. And this is the accuracy mode I usually use. This is a very nice complete to get concise report of the new and improved version of this wonderful app. Here’s another nice thing that Gaia just added – a new map layer called open topo. It’s based on Open Street Map, which means it has a similar look and feel to Open Cycle, but it has several significant cartographic improvements. – Better use of colors and symbology to show features like roads and trails. It looks like they just added it in the last few days, showing once again the development team is commitment to constant improvement of this app. I’d be curious if you give it a look and share here what you think. Hi Alan, I agree, a very significant improvement. Printing maps out for an upcoming Pyrenees trip, it is astonishing how much detail you get from French IGN maps for the trickier bits. I am not a great fan of the “snap to trail feature” of the route planning routine. It appears to snap mostly to trails that are not going to be the trails or routes that I want to hike. Thanks for the response to John above, the “baseball stats” were driving me batty and I had not yet found the place where this little trick was described in the documentation, such as it is. Getting rid of that bar cleans up the screen nicely. Hi Alan, thanks for the review! I’m checking out the new features with the trial, and was wondering how you close all menus to max out the map area like on your image. I still have the record/altitude/distance, etc info bar showing when I hit maximize. Thanks. Just thought I’d let you know that I bought this on your recommendation. 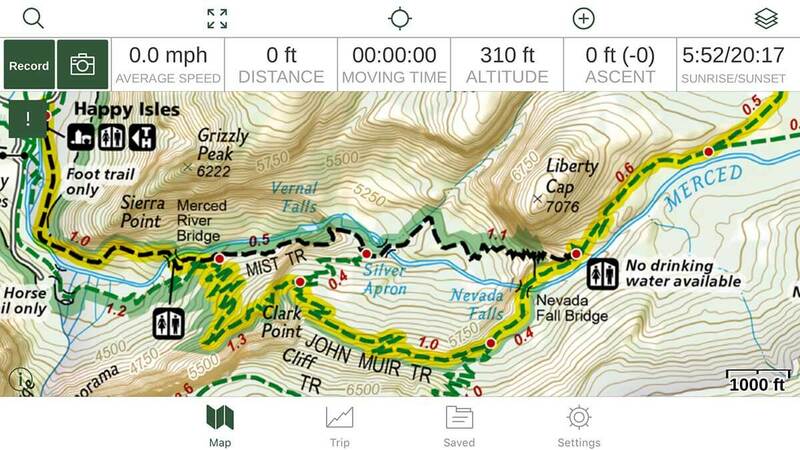 I have been using Backcountry Navigator, so I’ll be interested to see how this compares. Base map and vector maps seem like big pluses; I can’t wait to try it out. Thanx Alan; how do you keep your cell phone charged? Im hiking the PCT and the solar chargers out there are too heavy and so I won’t be able to keep it charged to use this.